They're selling the Pulse Blaster? I thought that was discontinued. Evidently not. Different countries do tend to differ quite a bit mind. And I don't think Buzz Bee ever permanently discontinue a blaster - they're bringing out slightly revised and renamed versions of stuff that was first released seven years ago. My arsenal (needs improving!!) XP270, vaporizer LOL, Helix, Expedition, water warriors steady stream, shield blaster 3000, 2 uknown red blasters. Oh well, life can be like that. Walgreen's around here also have an off-brand lever-action soaker that looks like a smaller Splat Blaster and seems to work similarly. Cheap Water Warriors on Amazon! Tiger shark and Orca are still available on amazon! A month or two ago, I saw several of the new Ultimate blasters at Wal-Mart, which is how I found out they were air pressure, including the Explorer whose PC was nested inside the reservoir and looked just like a CPS bladder. I can't remember what else I saw other than three of the new Ultimate blasters though. Next time I go shopping, I'll note what I find. Th Gorgon and some Ultimate blasters were there. But that was pretty much it. 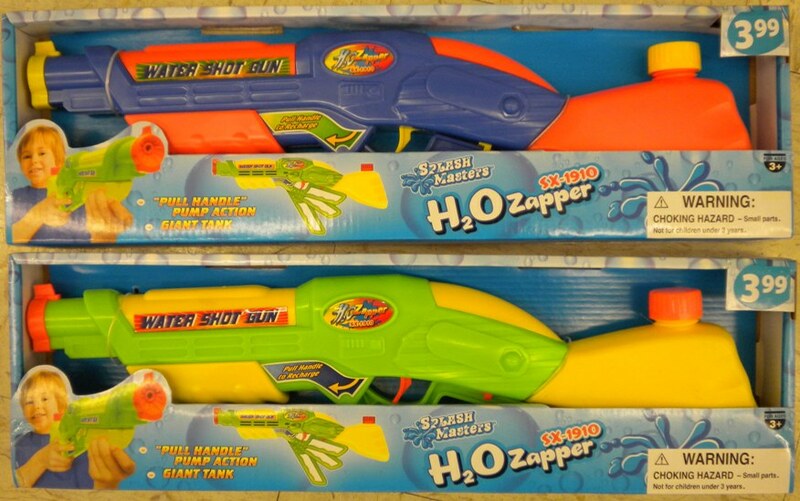 No Super Soakers or anything - just junk from Banzai and other off-brand companies. The SS Thunderstorm is available! Maybe in UK, I'm not sure about West Coast USA. As for the Explorer, I think we have another lawsuit. strato_2r5 wrote: As for the Explorer, I think we have another lawsuit. Shouldn't be... while it looks like a CPS chamber on casual inspection (it is a black chamber), it is actually hard plastic and the Explorer uses air pressure to shoot. The XP patents can't really stop BBT, since Hasbro/Larami were not the first to use AP.